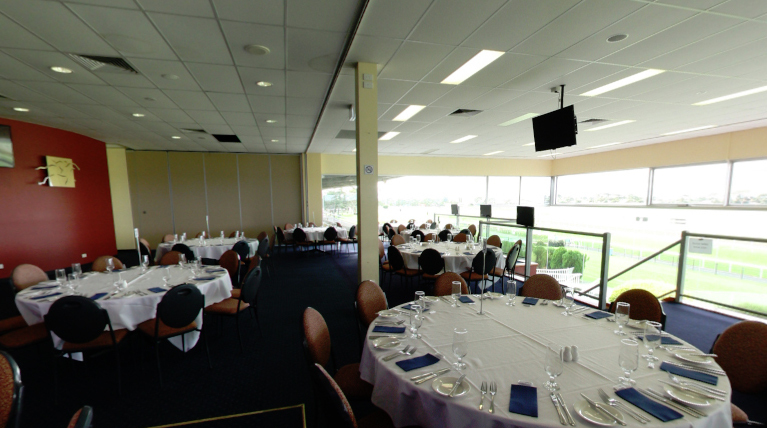 The Silks Room at the Geelong Racing Club is a modern and elegant function space with great views looking out over the racetrack. The function room is located on the upper level of the Briseis Stand and features a fully glassed front area, a private bar, dance floor and stage. Getting to and from the venue is easy with a large carpark for guests. One of the main benefits of having a function at the Geelong Racing Club is the garden area out the front of the stand which is ideal for pre-event drinks and photo opportunities. This makes it an ideal wedding reception venue with its picturesque setting. There are a number of flexible packages that can be tailored to meet your needs, and the venue can cater for wedding receptions, conferences and corporate functions as well as social events.